AgVantage Commodities have sponsored the Golden Triangle Race Series again which kicked off on Saturday with the Moree Picnics. Keep an eye out in next months newsletter and the website for more news of the Mallawa & Talmoi Picnic Races. Check out the gallery page for more photos. On the international markets wheat rose for the first time in three sessions as hot, dry weather in the southern U.S. Great Plains threatens the winter crop and rain in northern states delays planting of spring varieties. Corn jumped. Soybeans fell. The wheat market is struggling to find direction with concerns about US production offset by outlooks for increased world output. Spring wheat was 79% planted as of May 26, below the five-year average of 86% government data show. Wheat futures for July delivery rose 1.3% to settle at $7.0275 a bushel on the Chicago Board of Trade. The price dropped 1.4% in the previous two sessions. The grain has declined 9.7% this year as the U.S. Department of Agriculture forecast that world production will rise to a record in the 12 months that start June 1. Corn futures for December delivery added 2.7% to $5.6575 a bushel in Chicago on speculation that delayed planting will curb U.S. production that’s expected to surge to a record in the year that starts on Sept. 1. The price has plunged 19% in 2013. Soybean futures for July delivery fell 0.5% to $15.0175 a bushel on the CBOT. The oilseed has gained 6.5% this year. Today, the USDA reported the cancellation of 147,000 metric tons of export sales to China. On the cotton front price fell, extending the longest slump since June, on speculation that slowing growth in China will curb demand. The International Monetary Fund lowered its forecasts for growth in China, the world’s biggest user of the fibre, to about 7.75% this year and next. In April, the IMF projected growth of 8% this year and 8.2% in 2014. Through May 26, 59% of the U.S. cotton crop was planted, up from 39% a week earlier, the government said in a report yesterday. Sowing is about 17 percentage points behind last year. Domestic demand for old crop wheat stocks and sorghum as it comes off remains very strong with strong competition from buyers over increasingly limited available supplies. Prices for movement in to Queensland continue to strengthen, with a delivered Brisbane price at $336 equating to better than $280 ex farm for north of Moree. Also parcels of wheat located in sites in the north of the state are attracted significant premiums over generic track Newcastle numbers, around $317 track. As sorghum harvest advances slowly we have options available for sorghum stocks that have moisture levels above the GTA maximum specifications, please give the office a call if this is of interest. With rain over the last fortnight and forecasts for more over the weekend has seen an increase in the pace of sowings for growers who had reasonable levels of sub soil moisture. New crop wheat prices are at respectable levels, with track numbers in the mid $280s for Brisbane and Newcastle. This represents a basis of approximately AU$10/mt over current futures values. Futures values are currently finding support in the volatility around weather in the important planting period for Northern Hemisphere crops, however prices are expected to weaken if current large production estimates are matched by favourable growing conditions. 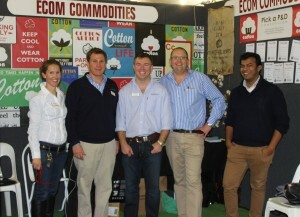 Numbers were down but enthusiasm was high as we looked to spice up cotton marketing with some loud graphics and a Pick a P&D competition to win a Sunbeam espresso machine linking into ECOMs significant history in the coffee market. Steve, Brooke, Rob and Chris along with ECOMs Trade Assistant and Domestic Co-ordinator, Ash Rajvanshi had an interesting 2 days catching up with growers and others involved in the cotton industry. With rain last week and rain forecast for the weekend, growers in the east of our region were busily planting the last of the winter crop which accounted for lower than expected numbers. Make hay while the sun shines! Futures markets have remained closed for the start of the week with the Memorial Day public holiday taking place in the U.S.. Wheat and corn finished higher at the end of last week with further rain slowing the progress of corn sowings while the winter wheat crop continues to deteriorate. The USDA’s weekly Crop Progress report, which has been delayed a day, will shed further light on how these crops are managing. Demand for limited old crop supplies is also providing support, with particularly strong export demand coming from China. Cotton has been trading in a down trend for the last week and is currently testing support levels at 82 USc/lb on the December contract. If the market opens below this level further losses could be likely, with the next technical level of support being around 78 USc/lb. The fall in the Aussie dollar has limited the damage to domestic prices, with a loss in value of 6.14% on the July futures contract being matched by currency falling 6.76% over the course of the month. For the past 2-3 weeks we have seen basis levels for new crop wheat at levels that equate to $12-20AUD/mt above the futures prices. For growers that have reasonable moisture levels and are planting at the moment, prices between $280-287/mt Newcastle track are rather encouraging and at this price, it is trading. Old crop wheat is still very strong from both price and demand. Currently ASW or better is priced at $333/mt delivered Brisbane, working back to a $283-type number at Garah, and stronger for locations closer to destination. We are able to look at ex-farm or delivered parcels as well as grain in the system. Sorghum demand for old crop remains present but only into certain market zones. Delivered, Brisbane, delivered packer seem to be the strongest which is predominately export-based. Domestic use of sorghum remains minimal as spreads between wheat and sorghum are still quite narrow. It was a very volatile trading session in US equity markets overnight as Chairman of the US federal reserve delivered a testimony to US congress that was fairly supportive of continued asset purchases. The DOW shot up 155 points but as he answered fairly direct questions on the “exit plan” that suggested it was coming sooner rather than later, the market quickly reversed and finished down 80.4 points. This also saw continued strength in the $US against all major currencies and our dollar broke technical support below 97c and this morning was trading at 0.96943. Cotton futures finished lower for the third session in a row with the July contract falling 41 points to 83.45c/pound, the December contract which represents the new crop was firmer, closing up 24 points to 84.39c/pound. The July/December spread widened to almost 100 points as traders roll from July to December, also selling pressure came from forecast rains in Texas which should relieve supply concerns from the US biggest producing state. Certified stocks remained above 500 000 bales, according to ICE, this represents some of the highest levels seen since June 2010 and weekly sales to china have been encouraging for this late in the season giving an indication of tight global supply outside of China. All eyes will be fixed on US weekly export data due out Thursday (our Friday). There was strength in grain markets overnight with Chicago wheat for July delivery up 8 cents at 688.5c/bushel and July corn gained the most in a week jumping 18.5c to close at 658.5c/bushel. Both grains rose on positive sales data from the USDA and also signs of increasing use in livestock feed. Wet weather in the next two weeks will delay sowing in the Midwest. Planting was 24% completed as at May 20 down from 42% on average over the previous 5 years.Soybean futures were higher overnight finishing at 1494.25c/bushel up 16c for the July contract, the price has risen for five straight sessions making it the longest rally in more than a year. Traders have commented that it is mainly spread trading related. Locally, we have seen some moisture across most regions over the past 24 hours, with anywhere from 8 to 17mm falling. We have not seen this weather event have any dramatic impact on pricing as yet. Sorghum prices continue to perform strongly delivered into Narrabri at a $275 and a $305 NTL track out there today. We also have continued demand for high moisture sorghum, particularly off the Liverpool Plains. Strong demand continues for feed type wheats, particularly SFW 70/10 & ASW both in the system and ex farm. With the recent rain we are starting to see more selling interest in new crop wheat. Multigrade wheat prices for 13/14 crop are currently sitting around the $281 NTL track for limited tonnage due to a weakening basis. Old crop and new crop chickpea interest remains relatively flat, which is reflective in a sub $500 delivered Narrabri number, which is back $15 from 2-3 weeks ago. With cotton futures falling below 84c/lb we are starting to see more interest from the mills in buying Australian cotton, this coupled with a weakening AUD and carry in the market we see opportunity to place orders at $460/bale for both 13 and 14 crop. Please call the office with any enquiries or to firm up where prices are today. The USDA’s weekly crop progress report was released last night and has highlighted the cracking pace in corn sowings that have been taking place. Acreage in the ground has increased by a whopping 43% in the past week, from 28% to 71% total, pushing close the 5 year average of 79% by this time of year. The actual amount gone in is approximately 16.9 m hectares, roughly equivalent to sowing the entire Australian wheat and barley crop in one week! The market was anticipating sowings to be closer to 60 – 65%, however the report was released after the market closed last night so futures values were largely unchanged, corn losing 3 USc to close at 649.5 USc/bu and wheat up 2 to close at 685 USc/bu. Losses may be limited though with rain expected to delay further plantings for a period, however the record crop expected is looking more possible now. The wheat market is finding support in the sub-standard winter wheat crop, with 41% of the crop now considered poor to very poor, an increase of 2% on last week. Domestically, prices remain well supported due to the dry start to sowing, with rain last week doing little to change this view. A chance of further rain this week has convinced some growers to begin their marketing program for new crop wheat. Most commentators are pointing to a much lower priced year for wheat globally with a resurgence in stocks on the back of larger U.S. plantings and improving conditions in Europe and Russia. Domestic production concerns with ongoing dryness, along with recent volatility due to weather and tightness in old crop stocks in the US, has seen multigrade numbers for APW rise from $260s last month to the mid $280s this month. However, the performance of last year’s market is an important reminder of how quickly things can change, with the drought induced rally on the heels of bumper US corn sowings not beginning in earnest until mid-June last year when they failed to receive any rain post-planting and experienced the worst drought in 100 years. Cotton prices have taken a hit overnight, losing 66 points to close at 85.75 USc/lb on the July. The performance of the Aussie Dollar over the last week has been a welcome change from the 1.05+ values we have experienced for much of the marketing year, now hovering around 98.00. A speech by Chairman Bernanke of the US Federal Reserve later in the week will provide the next direction for the dollar with any indication of an easing of the QE program potentially pushing values further down, however several commentators are suggesting a bounce could be more likely. Indications of further reductions in interest rate from the RBA over the course of the year will help limit gains in the AUD to levels we were seeing even a month ago. With regard to pulses, old crop chickpea values have dropped in the past few weeks. We were seeing highs of $500XF west Narrabri but these shorts are now filled and prices have come back to $495-500 delivered Narrabri. A few buyers are even telling us they cannot see how these prices are achievable in the current market as they can purchase chickpeas on a DCT basis (delivered container terminal) far cheaper than the published $500 delivered upcountry values. There is little new crop selling interest from growers as the bulk of the crop is not yet planted. Mungbeans have come off the boil with India being the only buyer in the market due to China not buying. Their demand has softened and prices have fallen also. They have been receiving reports that the Aussie crop is significantly lower this year but have still been seeing lots of offers as growers have been actively pricing. This has resulted in them pulling back and so too has grower selling. The market is expecting prices to strengthen once the current offers dry up and demand returns. We currently have strong demand for all grades of wheat both on farm and in the system, particularly ASW and SFW 70/10 grades for several destinations in Queensland and NSW. Sorghum is also performing strongly with prices delivered in to Narrabri moving up to $275, or around $260 ex farm for most locations from the north, through to Narrabri and the LPP. We do have demand for high moisture sorghum so please call if this is an issue for you. Homes for high moisture are tight but we do have some at the moment. Please call the office with any enquiries or to firm up where prices are at today. Grain futures continue to come under pressure due to a strengthening US dollar, making more expensive on the international marketplace. Pressure may also have come from much needed rain falling across parts of the Ukraine and southern Russia yesterday. The US Department of Agriculture is forecasting a record global wheat crop this year, due to an increase in plantings in all major wheat producing countries however on the domestic front we have seen further strengthening and a tightening of spreads across all grades of wheat as dry conditions persist and a negative outlook for prospective plantings for this years crop tighten supply of last years stocks pushing prices higher. This market is clearly weather driven and looks to remain firm as long as the dry run continues. Cotton futures remain volatile falling three times in four sessions as mounting concerns that global supplies will be more than sufficient to meet demand, global inventories of cotton will climb 9.4% from last year to a record 92.74 million bales according to the US Department of Agriculture. July cotton futures in New York fell 42 points overnight to settle at 86.0c/pound. Domestic cash prices have been firm aided by a three cent fall in the Aussie dollar and basis remains steady and around 270 points on leading to a respectable $450 cash price. Local demand for sorghum and all grades of wheat have been strong into the domestic feed markets with $265 for sorghum delivered into Narrabri and around $250 ex farm for Bellata. We have demand for sorghum XF Mullaley/Tambar/Premer at $255-260XF and have the ability to take SOR2 or high moisture sorghum as well. Sorghum delivered Brisbane values are also very strong and are around $310-315 delivered. There also has been some very strong Newcastle track numbers for ASW with bids ranging from $300-320 for specific sites. We also have strong numbers for any stocks currently held in the system both Brisbane and Newcastle lines. Similarly we are buyers of all grades of wheat XF and in the system. Also please enquire with the office for any mungbean pricing at the moment. The USDA released their first WASDE report outlining production projections for the 13/14 crop over the weekend. They are predicting a sharp rebound in global stocks of corn and soybeans in particular, reaching close to record levels, along with large values for wheat and cotton. This resulted in the market significantly softer on opening on Monday, however managed to regain much of those losses overnight as uncertainties surrounding weather became the primary focus. Corn planting progress remains sluggish with 28% of the crop in the ground versus 65% 5 year average, and forecasts for more rain over the weekend across the corn belt raising concerns the current yield estimates for the crop will be markedly lower. Wheat and soybeans fed off this uncertainty while bulls also found encouragement from continued strong demand for limited remaining stocks. What is clear is that while the USDA report was overall bearish for most commodities heading in to the new year, weather is having a large impact on the fortunes of the market and will continue to play a major role until new crop production is secured. USDA’s WASDE report will undoubtedly be revised several times over the coming months. Cotton was also softer by 55 points after losing more than 100 points on Monday to close at 86.09 USc/lb for July. This is after a week of firmer prices pushing close to the 88 USc resistance level. Support is currently being found in the tightness of US stocks and continuing strong demand coming out of China, while gains are being limited by sluggish mill demand at prices above 85 USc outside of China. While picking is getting close to wrapping up across the valleys pricing for 2014 crop has started to take place. Given the current volatility we are seeing in overnight trading we see as an opportunity for growers who are interested in pricing 2014 cotton at $450+ to place market orders. Quite often futures can trade significantly higher overnight and trigger a market order but settle or close below these highs and the price the following day is below your target price. ECOM have been competitive for 2014 cotton and if you would like to discuss, we suggest contacting your local AgVantage office. Locally, much needed rain has fallen across much of Northern NSW and in to Southern QLD however we would have liked to see a great deal more fall. The max appears to be around an inch around Narrabri, while 10 to 15 ml was more common from Moree to the Liverpool Plains and out to Dubbo, and 5 to 10 ml for growers at the Border, North West and in the Macquarie. We don’t anticipate that this rainfall will have an immediate effect on the strong demand currently being seen in domestic feed markets. We still have strong demand for sorghum currently at $260 delivered in to Narrabri, or $250 XF in surrounding areas, or for movement North around $260 XF in the border region. We also have strong numbers for any stocks currently held in the system both Brisbane and Newcastle lines. Similarly we are buyers of all grades of wheat XF and in the system. Also please enquire with the office for any mung beans pricing at the moment. With two sessions left until the next round of USDA World Supply and Demand reports are released, the trade are focused on positioning themselves ahead of the release. Corn traded down all session, but firmed into the close, with planting pushing ahead in central states ahead of another weather event likely to pull up the planting effort by weeks end. Wheat followed corn lower, pressured by an improved outlook for crop maturation, and the market digesting a surging increase to 42 million tonnes of wheat in Indian government warehouses. Soybeans moved higher on tight US stocks, and confirmation of 3 cargoes having been bought out of South America, the new crop contract struggled under the likely swap of some acres from corn to beans. Cotton gained 53 pts on the July contract, but ranged a wide 272 pts. The firmer finish attributed to the slow planting pace of this years current crop, and the expected decrease of US stocks by 500,000 bales. Currency has rebounded to around the mid 1.02 level this morning, on some improved trade data out of China, and better employment data locally, after dropping into the low 1.01’s following Tuesday’s unlikely rate cut. Cotton prices have kicked into the $440’s for both 13 and 14 crop. It will be interesting to see the USDA forecast for 13/14 crop, with the International Cotton Association forecasting an increase in ending stocks to 84 million bales. ECOM also have interest in the longer dated 15 crop with a price today of $431. In domestic markets, basis is remaining strong for all grades, and the drop in currency helping to increase prices for all grades of old crop. We are buyers of sorghum and all grades of wheat, ex-farm, delivered NSW and QLD destinations as well as your local AWB/Graincorp sites. The chickpea market remains stagnant at around $500 Narrabri/$510 Dubbo with some continued grower selling keeping a lid on prices. With no run up in demand prior to Ramadan, maybe we should start to expect a drop off in prices towards the end of the month. We have been hearing, and seeing a lot of dry sowing, and moisture seeking and even watering up from growers hoping that a chance of rain next week, turns into something substantial. New crop pricing for wheat has jumped up into the mid $280’s Newcastle and Brisbane track. For growers interested in forward contracting new crop chickpeas, we have hectare & fixed tonnage contracts available delivered Dalby. Grain futures have fallen victim to the latest weather forecast for US growing regions. A drier outlook for the next fortnight has raised hopes of a rapid increase in the progress of corn plantings, resulting in a sharp sell-off in corn, wheat and soybean markets. Wheat finished the session down 18USc to close at 702 USC/bu, corn lost 24USc to close at 636 USc/bu, while soybeans lost 18USc to finish at 1369 USc/bu. The improved prospects for corn plantings has come at a crucial stage for the crop, with a rule of thumb suggesting crop planted later than May 10 begins to incur yield penalties. This week’s USDA crop progress report has only 12% of the crop planted, well behind last year’s progress of 69% and the 5 year average of 47%. A drier run over the next couple of weeks will go a long way in salvaging what was anticipated in being a record corn crop this season, however as we have already experienced over the last few weeks any slight change in the forecast can have a dramatic impact on the fortunes of the market. The winter wheat crop continues to battle also, with 39% of the crop currently rated poor-very poor, however reports of a near record wheat crop to come out of India have contributed to the commodities fall. Cotton on the other hand has managed another strong performance, increasing 96 points on July to come out of the volatility experienced last week better overall, closing at 87.39 USc/lb. While much of the volatility last week was speculator driven, the planting report has highlighted the slow pace of sowing of cotton with only 17% in the ground compared with 35% last year. The US is also still managing to maintain a strong export pace into China at the moment which has also been supportive. Domestically, the continued dryness experienced across the east coast should limit the large losses experienced in futures values. Demand for all feed grades remains strong across buyers, with homes available for destinations from the North to the plains. Also strong numbers can be found in the system for most grades, particularly APW and ASW both Brisbane and Newcastle track, while premiums can be found for certain sites. Please call if interested in pricing a parcel. With sorghum harvest continuing into May price, has firmed over the last fortnight, with strong demand still available for prompt homes along with pick up or delivery delayed to June/July. Track numbers have also pushed in to the $270s. We continue to have strong demand for any mungbeans that are being harvested at the moment, please give the office a call to discuss pricing options. ECOM have a strong appetite for 2014 Cotton, having made recent sales to end users.